We have a lot of people who have been following this blog for a long while. When we travel about the world we get to meet many of our readers but meeting the 'veteran readers' is always an added bonus. 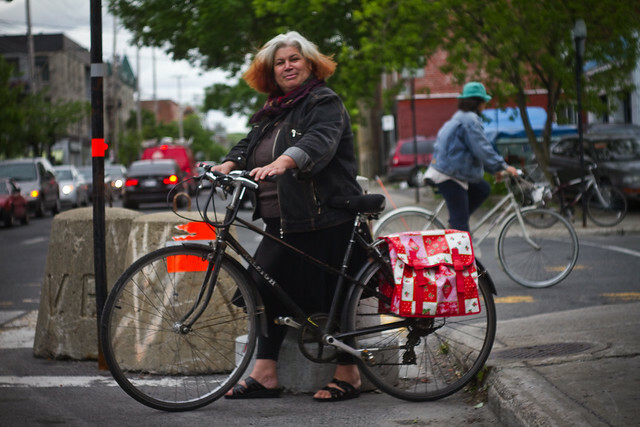 Like Maria, in Montreal, at the launch of Montreal Cycle Chic last summer. A blog is many things but it is nothing without our readers. Hooking up with Maria in Montreal was a pleasure. Bike love to you, Maria! At least now the ghastly remaining dyed hair, which had faded from "reddish-black", to a horrid orange, has got the chop, and grown back silver with black/brown streaks! It was summer, but not very warm that day. Grey and chilly. Fun though, as was the talk at La Grande bibliothèque. Oh, what a dreadful windy day that was! Hardly normal June weather, and more like the fal weather we've been having the last few days.